Welcome to my first blog crossover! There's a cool, supportive community of comic book blogs out there and while I've always been happy to participate, I just haven't managed to because of that wretched "only 24 hours in the day" thing. The idea: Many of these blogs focus on a single comic book hero/series, so we thought it might be fun to off-road it for once and shill for a completely different series WE think YOU should also be reading. Now, me, I discuss a lot of different comics, admittedly mostly vintage stuff, but I suppose Star Trek comics have been a daily thing here for a while now. I am thus NOT going to be talking about IDW's Star Trek comics in this article. No, instead I'm going for a completely different IDW comic, one that doesn't even rely on licensed material (which represents most of their output). There's nothing like it on the stands. It feels like Morse is doing the comic book version of a jazz set. When his surreal story is about to end, he just takes off in a different, but completely valid, direction. 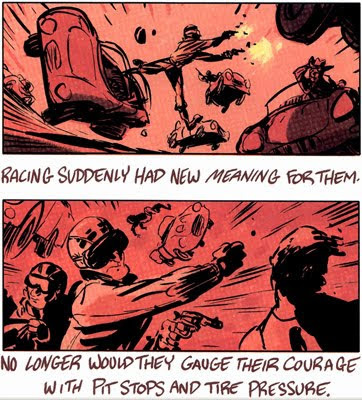 Only in Strange Science Fantasy would a postapocalyptic drag race turn into a war tale where tanks shoot at elephants, only to later instill you with hope for the future via a lighthouse metaphor. Though Morse is using prose over and under his images instead of more standard panel configurations, he nonetheless demonstrates a very real understanding of what makes comics awesome. 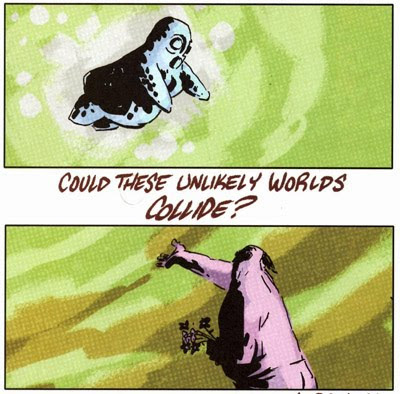 SSF sits halfway between those strange short stories from the 1950s and Kirby's cosmic god oeuvre. There's something naive about these tales where anything can happen and "logic" is something that's only ever internal. Headlight. The Shogunaut. Script Girl. 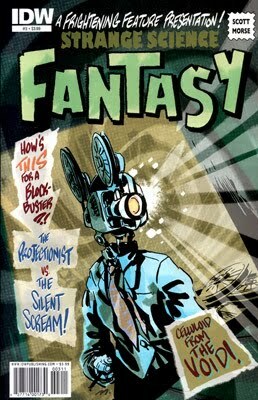 The Projectionist. They're not only bizarre in a Doom Patrol kind of way, you also feel for them. There's something about Morse's expressive art that makes you care even though you're only with them for an issue's length (albeit one with at least 28 pages). I can't wait to see what he comes up with next. No speech bubbles. No multi-colored, icon-happy captions. No meanwhiles and laters. I've never been so happy to read narration because it doesn't cover Morse's really cool artwork. 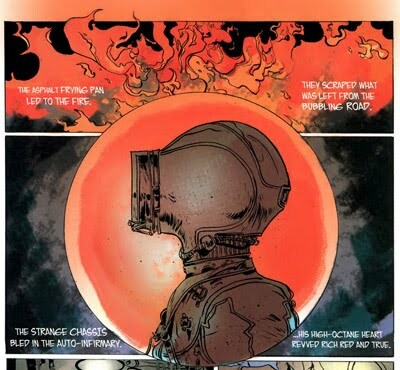 Paul Pope does an evocative piece inspired by the characters from the story at the end of every issue. Just makes me want to read more about them, and a beautiful piece of eye candy besides. When you think this comic can't groove any more, Pope proves you wrong with his bittersweet farewell. So there you have it. 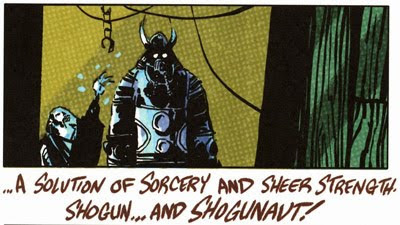 If you like awesome comics like I do, and crave what I call a "pure comics experience", give Strange Science Fantasy a whirl. Issue 3 is out right now with more to come. Plus, click on the 5 Things to Like tag below for more recommendations from yours truly! This is a great series. I would have covered this one is I didn't do Tomahawk and Thor. It takes something old and mashes it up with a new approach. And I might have done Thor The Mighty Avenger if you hadn't gone and taken it. We obviously live in the same mental real estate. This looks like a great read! IDW takes a bit of hunting out this far south but it looks like it has just the kind of pulp feel I like! Might have to try a few copies from a store online... Nice post! These look very intriguing - I need to check them out! Dial H for Hell's Going On? What If... the Hulk Went Berserk? What If? Extra! Who Survived Korvac's Reality? What If... the Invisible Girl Had Died?